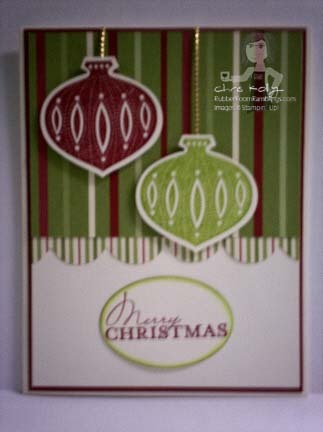 I love the Tasteful Trims Big Shot Die available in the Stampin' Up! Holiday Mini Catalog! It is like having tons of trim punches all in one tool. I can add a gorgeous matching trim to any card and/or scrapbook page painlessly in only minutes! This is one of the cards we made last night at my Wright Club get together. We used, of course, the Tastement Trims Die; the Stampin' Up! Contempo Christmas Stamp Set and some Jolly Holiday Designer Series Paper; along with the Ornament Punch and the Wide Oval Punch. The colors are Very Vanilla, Cherry Cobbler and Old Olive. This is a quick and easy holiday card that's lots of fun!